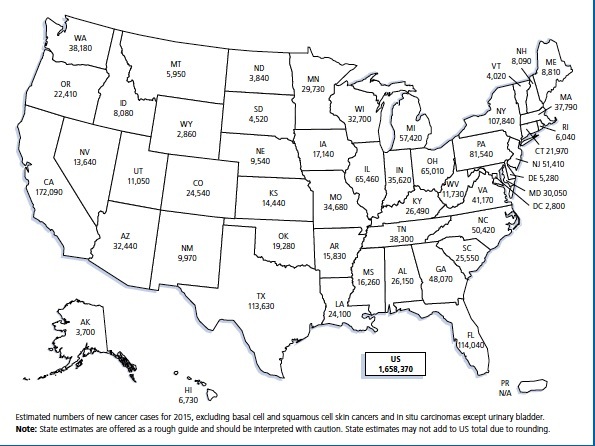 According to “cancer.org.,” the estimated number for new cancer cases in the USA for 2015 is 1,658,370, (this number does not include some non-invasive cancers). Approximately 589,430 people will die of the disease. That translates to about 1,620 people per day. Vermont will see around 4,020 new cancer cases in 2015. Cancer is the second most common cause of death in the USA, with heart disease being number one. The most common cancer in women, other than skin cancer, is breast cancer. One out of every seven or eight women in the USA will get breast cancer at one point in her life. By the end of 2015 there will be 231,840 new breast cancer cases in the USA with 40,290 people dying of it. In Vermont, there are expected to be 530 new cases this year with 80 deaths. I know I am throwing around a lot of numbers here, but I wanted to show how many people are affected by this disease. Cancer occurs as a result of mutations, or abnormal changes in the genes responsible for regulating growth of cells and keeping them healthy. Normally, old cells die off and new cells replace them. Mutated cells gain the ability to keep dividing without control, producing more cells and forming a tumor. Breast cancer starts in abnormal cells in the breast which grow very fast and form a tumor. There are different types of breast cancer. The most common type of breast cancer is IDC (invasive ductal carcinoma). It spreads into the surrounding breast tissues. About 80 percent of breast cancers are invasive ductal carcinoma. Another common breast cancer is lobular carcinoma, which is a cancer that starts in the milk ducts. It is often harder to diagnose because it’s not one big mass, but sends out filaments. The actual tumor is often much larger than what the ultrasound indicates. Most people diagnosed with breast cancer are women, but men can also get breast cancer. I chose to write about this topic because my mother was diagnosed with breast cancer a couple of months ago. I didn’t know how to react. It felt as though someone had punched me in the gut. My aunt also has to deal with breast cancer. Hers has metastasized and gone into her bones. Doctors are treating it as a chronic condition. Right now, she is doing great. My mother often calls my aunt to ask her questions or to swap gallows humor. “It’s nice to talk to somebody who has gone through the same thing. Doctors throw a lot of medical terms at you, but other patients understand how you feel and they are not horrified when you make bad jokes about losing your hair,” she said. Cancer is a sneaky disease and over the last couple of months, I found out that many U-32 students have family members who are affected by it. It can be a scary thing. To our parents’ generation, getting a diagnosis of cancer was like getting a death sentence. But this isn’t so true anymore. More people are staying alive in spite of cancer than ever before. So it might be better for young people to talk about it more, especially if it helps cancer patients to feel less lonely when they’re sick. Thanks for writing about this important topic. I agree with your idea that it’s good to talk about cancer. Talking builds solidarity, builds community and sharing knowledge helps everyone learn more about ways to handle a diagnosis.